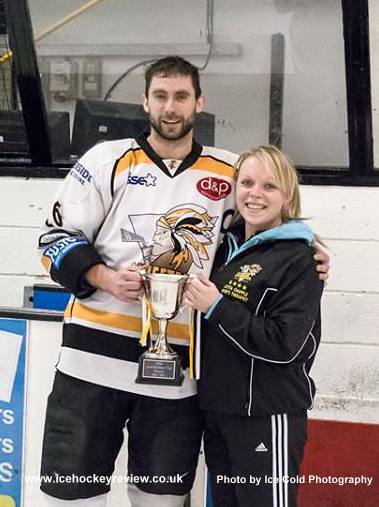 Chelmsford Chieftains picked up the first piece of silverware of the 2015/16 season after they beat Invicta Dynamos 9-1 on Thursday evening to secure the South East Cup. The cup is being played for between 4 teams - Chelmsford, Invicta, Streatham Redskins and London Raiders with each team playing the others once home and once away. Not all the games have been completed yet but the Chieftains have already won the group with 5 wins from games and, as such, can’t be caught. In Thursday’s - rather one sided - game the Chieftains were already 4-0 up at the end of the first period and outshot the Dynamos overall 56 to 20. Top scorer for the home side was Juraj Huska with 3+1 and the Invicta consolation was scored by Arran Strawson on 29.36 on a delayed penalty call. Another interesting aspect of the game was that netminding brothers Ewan and Damien King were at opposing ends of the ice, playing for Chelmsford and Invicta respectively.